October | 2013 | Arthur in the Garden. We have experienced our first frost. It was very light and a only few plants were affected. 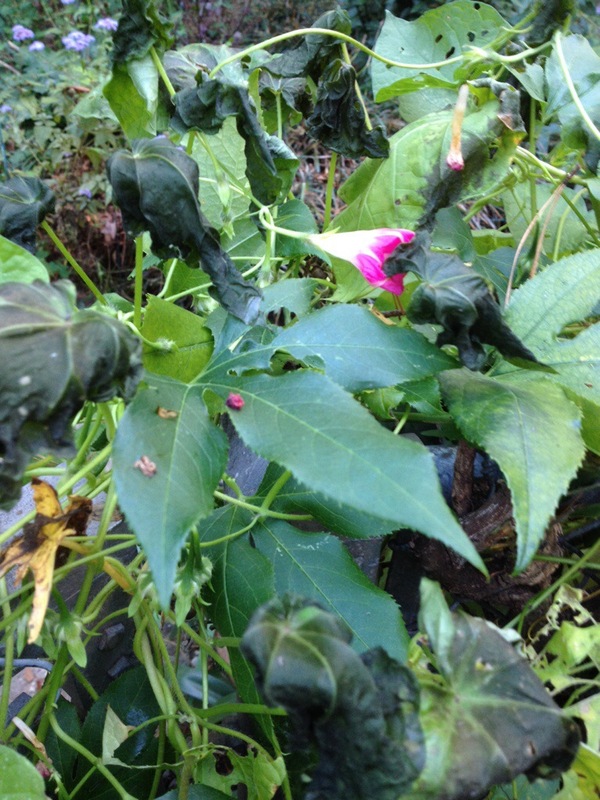 The morning glories leaves were wilted but the passionflowers were unharmed. 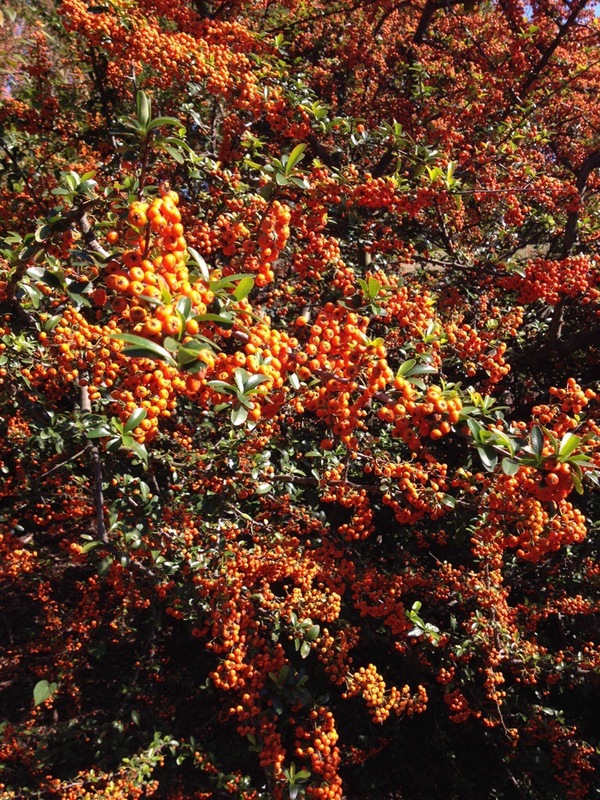 The pyracanthas are loaded with berries. They are not a favorite with the birds so they last on the plants until Spring. 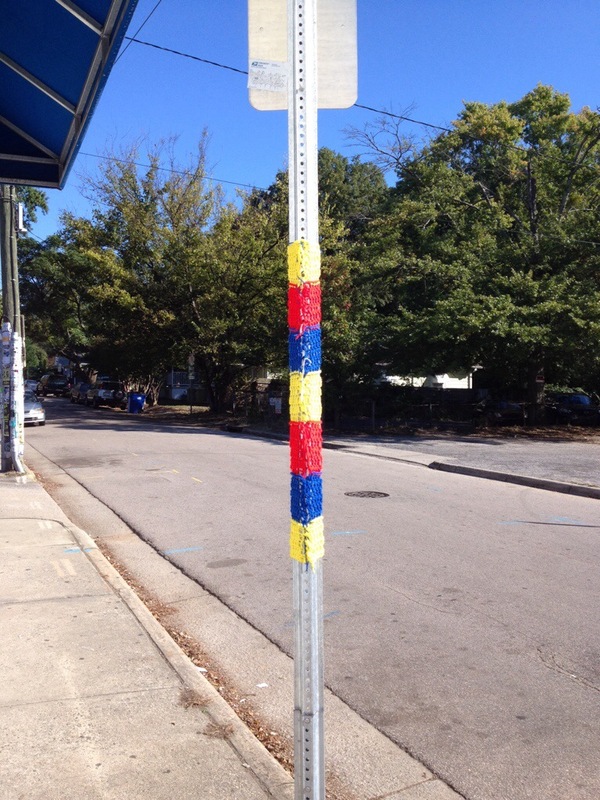 A few yarn bombs have appeared around Downtown Raleigh. 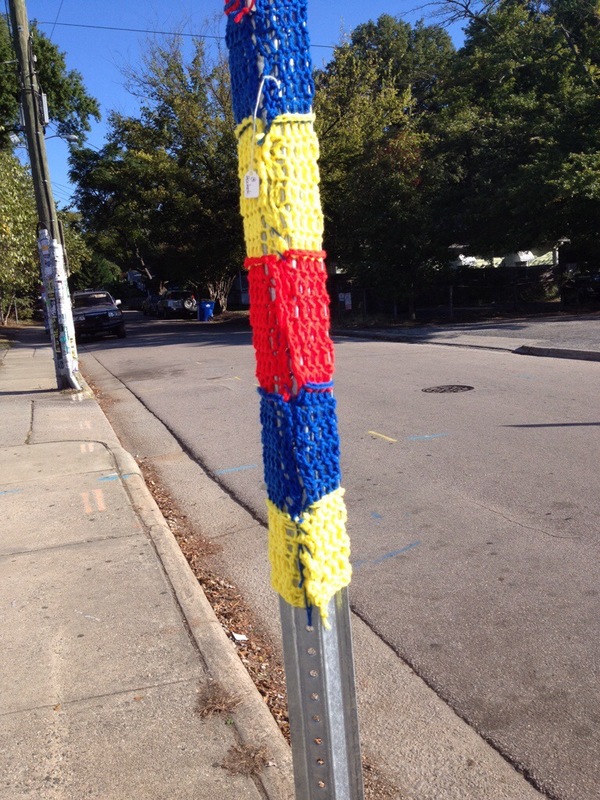 They are cute and add some whimsey to downtown. This one has a tag: Drop Stitch Duo. They have a Facebook page. It is great to live in such a dynamic city with an active art scene! Humans are not the only animal to raise other animals for food. Amazingly ants will raise aphids for a secretion called Honeydew which is produced when the ant rubs the aphid sides with their antenna. 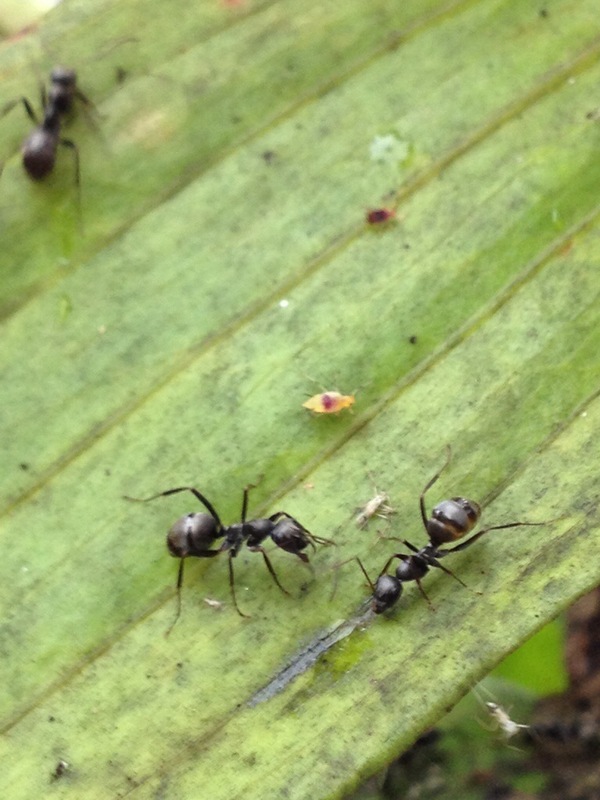 Below are black ants attending their aphid herd on a lily. The ants will move the aphids around the plant to the newest growth as aphids feed on plant sap and also protect them from predators and parasites. 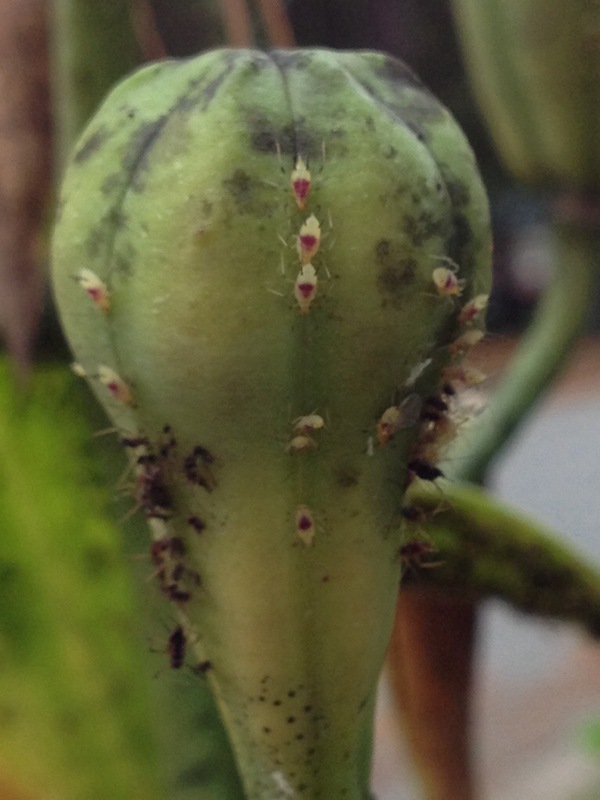 Below are the aphids feeding on the seed pod of a lily. Some species of ants will take the aphids underground in the winter to feed on the roots of plant and to protect them from freezing. Other species will save the eggs of aphids underground during the winter months then move them back to the grazing plants in the spring to start a new “herd” for honeydew the following spring! It’s always a good day for yard work! 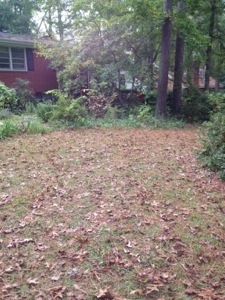 The oak leaves and pine straw have covered the lawn so I thought today would be a good day for a first rake. 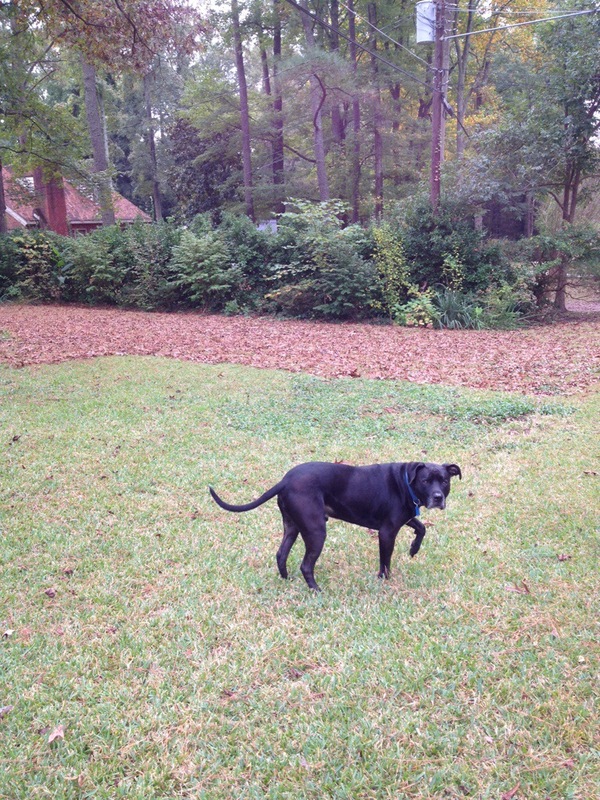 Gus enjoyed running through the piles and finding limbs to chew. 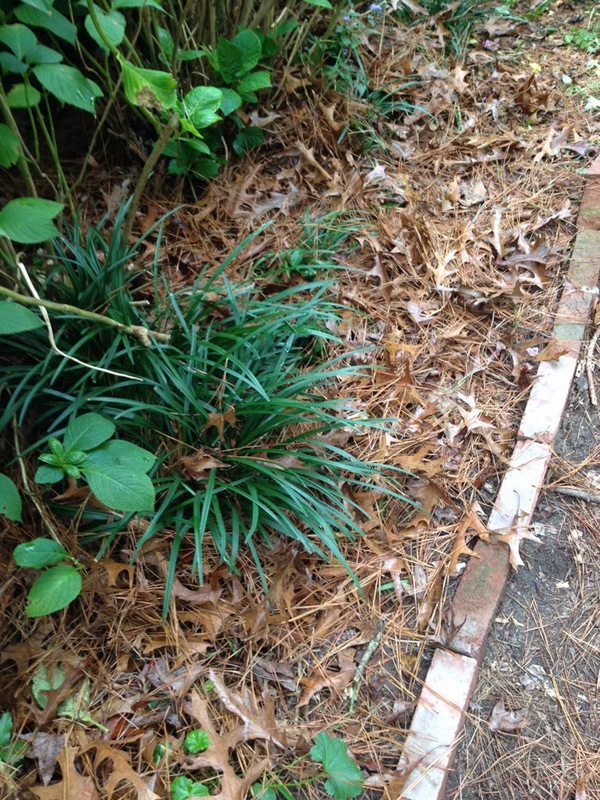 The beds look so neat and proper with a fresh layer of oak leaves and pine straw. I think it’s funny how all my neighbors rake them to the curb for collection by the city. They then go to the garden centers and pay for compost and mulch in the spring! Crazy!! Luckily Raleigh has a yard waste center were they compost all the yard waste from the city. On cold days the huge piles of compost look like volcanos with all the heat and steam they produce! All you need is a truck to go out there and get all you want! 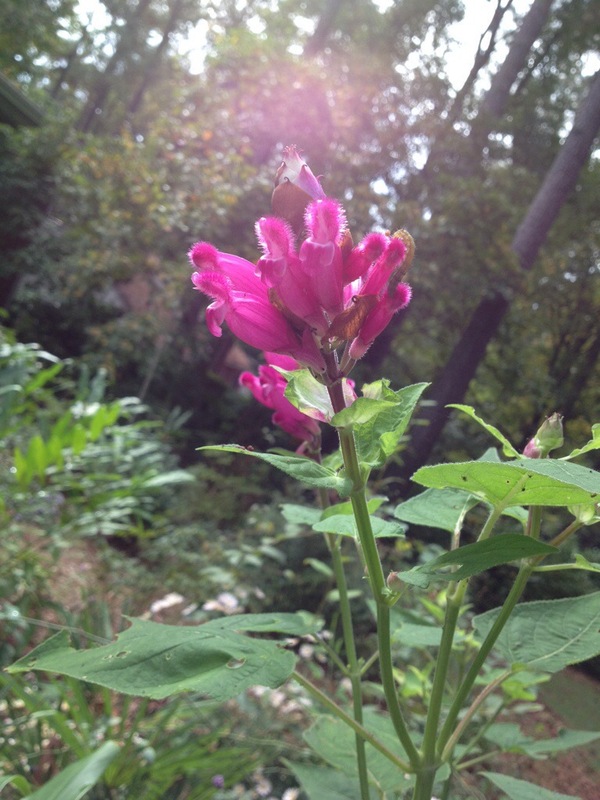 One unusual Fall bloomer is Salvia puberula ‘El Butano”. It grows about six feet tall and as much wide. In October it produces bright pink flowers. The foliage has a pungent fragrance when you brush up against it. It is not what I call a good smell and it lingers with you for quite a while. This plant doesn’t really have any desirable characteristics and I don’t really know why I keep it around? I probably will remove it in the next few season to make room for something else? 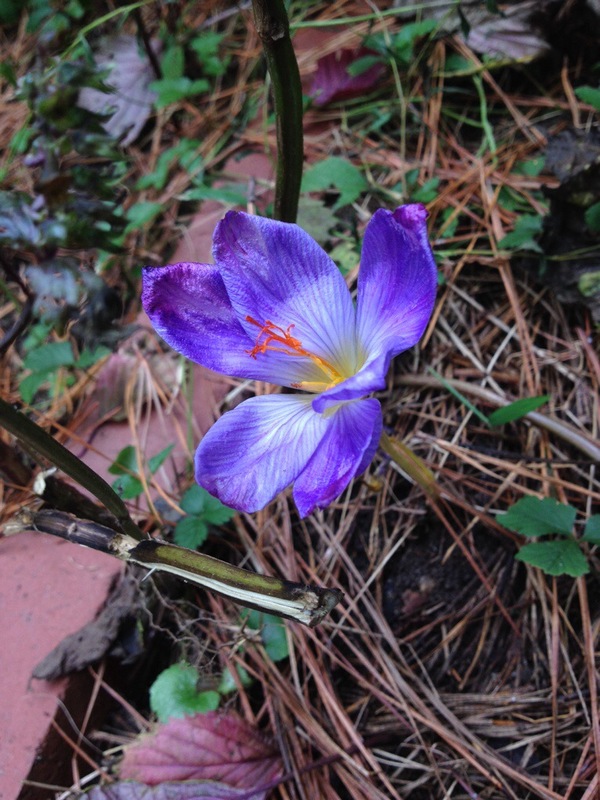 As I was removing overgrown perennials I noticed a saffron crocus blooming! I often forget about their locations around the yard and over plant them with annuals in the Spring. They are a nice Fall surprise. 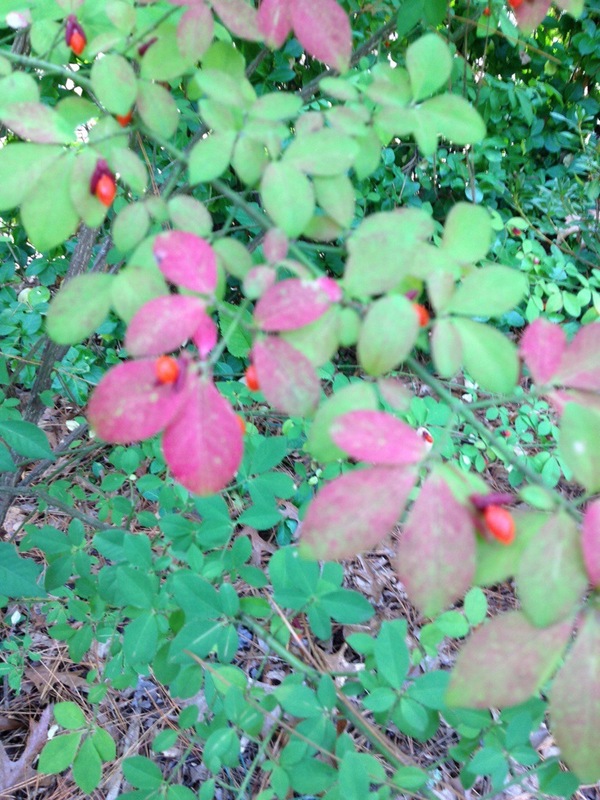 The Burning Bushes are beginning their Fall show with leaves in nice shades of burgundy and red! The birds are enjoying the berries, too! They are so easy to grow they are almost weedy! They form a mound about 18″ to two feet tall and about three feet wide with no special care! 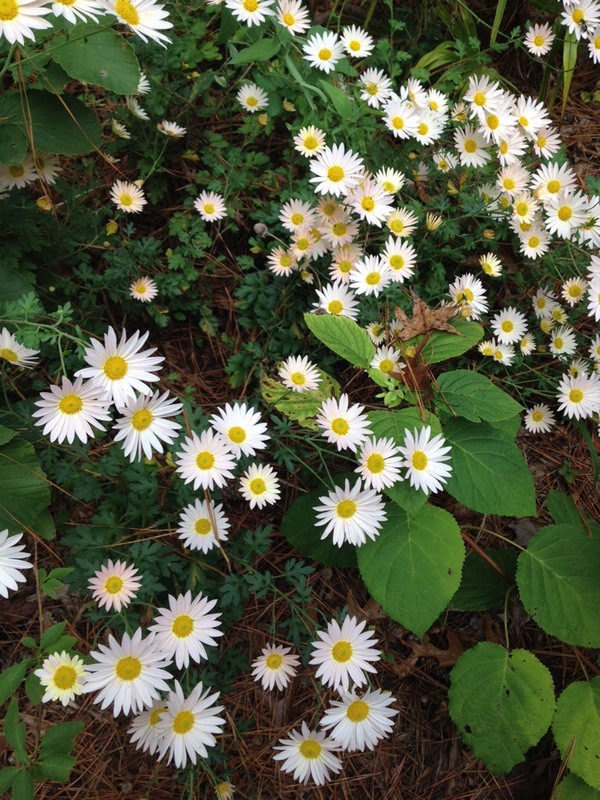 They are amazing when they burst into bloom in October!